We are in an era where healthy living is a must, which is why everywhere you turn there are recipes for delicacies that are home-made. If you are one of those individuals who is looking to live the “right way,” then it is important to fuel yourself with the right things, such as dried fruits and proteins. But you can’t do this if you don’t have one of the best food dehydrators in your kitchen. A food dehydrator is simply a device that dries food without the help of sunlight. Using a fan to circulate hot air inside the chamber, the air flows through the food you store in it via layers of trays. Eventually, this air will expel the water inside the food, leaving your delicacy completely dry. Of course, you can try the primitive sunlight method of drying food, but there are a lot of factors that would make it annoying, time-consuming, and ultimately, unsuccessful. First, the sun doesn’t always shine, leaving your time limited. Second, there are pesky insects that want to consume your food as much as you want, making it unsanitary and unappetizing. Third, the time you need to do this might leave you starving for days. Because of these reasons, opting for a food dehydrator is your best choice, as it saves you time and money. 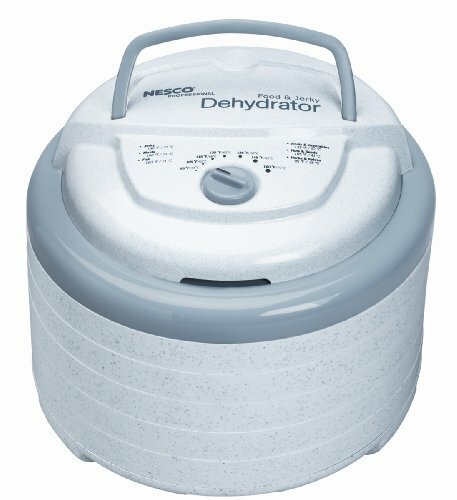 Top 3 of the Best Food Dehydrators for Fruit and Jerky – Which one is the Best? 1 Top 3 of the Best Food Dehydrators for Fruit and Jerky – Which one is the Best? 1.4.4 Dry Foods Are Delicious! Another food dehydrator you should consider is the Nesco American Harvest FD-61WHC. This one is also from Nesco, so you can expect the same quality and performance as the previous one. It uses variuos features and technology to ensure the optimal quality of the flavor and dryness of your food. The Nesco American Harvest FD-61WHC is fast when it comes to heating and drying food. Unlike the traditional food dryers that take days to dry food, this one will only need hours to prepare your delicacy. Thanks to its Converga-Flow Drying System, you can dry variety of food using under 500 watts of power. You don’t have to be an expert chef to know that a food dryer is not enough in drying delicacies. You will need an adjustable thermostat to control the drying process, as the right temperature is key to food that is dry, not rubbery. Of course, you will need several trays, jerky spices, and cures too. And if you can find a food dryer with a jerky gun and several tips, even better. And wouldn’t you know it, all of these amenities are in Nesco American Harvest FD-61WHC. One of the troubles with having a food dryer is the cleaning process. With all the mechanical pieces, it can be hard to clean, as they can be ruined when submerged under water. Luckily, the Nesco American Harvest FD-61WHC eliminates this issue. Except for its powerhead, the product is completely safe to dishwashers. Those who have tried the Nesco American Harvest FD-61WHC say that this product is excellent for making beef jerky. And they really love the fact that it comes with a manual and recipes to make the use of it more convenient, especially to amateur cooks. It has no and off switch. Instead, it has only a power plug. If you are looking for a food dehydrator that can dehydrate different varieties of food at once, then you should pick the Excalibur 2900ECB. This device possesses nine trays–which is the largest on this list. 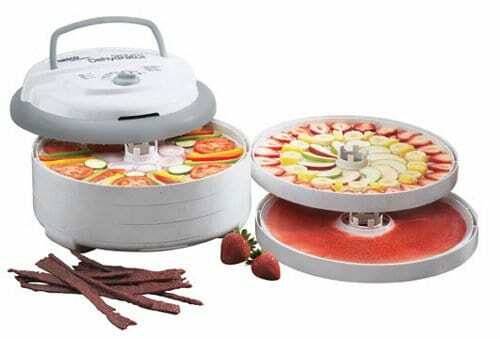 This food dehydrator is ideal for large family gatherings, andalso suitable for outdoor and garden usage. Unlike the food dehydrators from Nesco, the Excalibur 2900ECB has a switch so that you can safely control it before and after use. Without the presence of a switch, a product may be susceptible to electrical grounding, especially if it has weak wiring. The Excalibur eliminates this risk, so you can safely dehydrate ay and all fooods. Even though the drying power of the Excalibur 2900ECB is not as high as the Nesco products, you can still dry your food just as well. It has a drying capacity of 400 watts and operates at 110 voltages. This drying power is more than enough to remove water from the thickest beef slices without a problem. Plus, it also includes an adjustable thermostat and 7-inch fan for precise, even drying. All of the poly screen plates inside the Excalibur 2900ECB are removable, so cleaning them is an easy task. They are also safe for dishwasher cleaning, so you don’t have to worry about surface damages. The Excalibur 2900ECB 9-Tray Economy Dehydrator is a product that has a tremendous appeal especially to those who have tried it already. Many love the fact that it possesses more trays than other food dehydrators. Some say that it has a sturdy and compact construction, which makes it last longer than any other related products. Because it is easy-to-use, this products already has several commendations to users–even the professionals. The Coverga Flow System is the primary technology of Nesco Snackmaster Pro Food Dehydrator. It is a patented design that this product uses to hasten the dehydration time of foods. There are certain factors that can affect the drying time of food, such as the thickness of the slices, the type and amount of food used, the presence of water in food, and air. However, with this food dehydrator you will not wait long for your food to be done, as it nuetralizes these factors and speeds up the process. 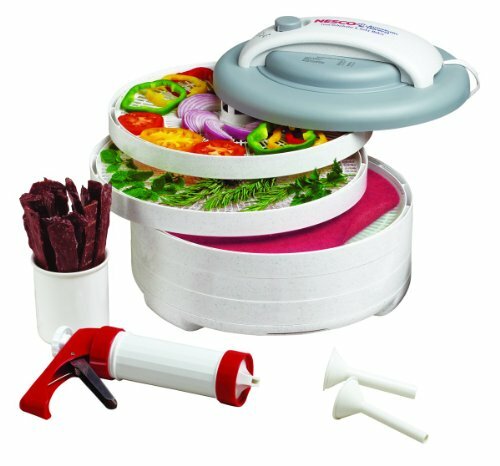 The Nesco Snackmaster Pro Food Dehydrator has a unique design to make any food dry and delicious. It has a top-mounted fan and an adjustable thermostat (95 to 160 degrees Fahrenheit), which ensures that your food will not lose it taste even after being subjected to a drying temperature. More importantly, the flavors won’t mix, even if you put several variety of food inside the dehydrator. It has five trays that you don’t need to rotate, as well as an exterior made from opaque material, to block those harmful external lights. When your purchase this product, you geet everything you need to dry foods like a pro. There is a comprehensive list of dry food recipes, along with two solid and meshes sheets and three packets for jerky spices. Users who have tried the Nesco Snackmaster Pro Food Dehydrator always love the “quietness” of this product. They also commend the presence of the mesh sheets, which are essential in drying soup and stews. Finally, they say that this food dehydrator is easy to clean as well. As we mentioned earlier, a food dehydrator is meant to create food that is dry, but healthy for the body. Fruits and vegetables that have been dehydrated don’t require artificial preservatives to preserve them. or keep them edible. Plus, drying the food will let you get the most nutrients out of it; In the case of fruits and vegetables, it would be mineral, vitamins, and fibers. When it comes to food, transparency is not about seeing the other side. Instead, it refers to signs, or indications, that your food has been compromised by harmful elements such as molds and bacterias. By dehydrating your food, you can easily find, or see, if this has occured. Food dehydration can let you preserve your food for one to two years without seeing any traces of mold! You may be leary about eating food that has been stored for that long, but trust us: dehydrated foods are safe to eat! Many believe that drying lessens the flavor of food. That is a misconception that needs to be eliminates. Some of the tastiest food that we have ever tasted are dry foods, such as raw veggie burgers, fresh bread, beef jerky and even Kale chips and crackers! Because they are delicious and healthy (don’t forget that), you can increase the appetite and food consumption of your children. You will be happy that they are healthy and well-nourished at the same time! One of our fears in adding kitchen appliances is the expense that they can place upon us. We have a truncating economy, so being well-budgeted is a must these days. However, money issues should not be a problem, especially when it comes to food dehydrators. They do not have a steep price, even those that are for professional usage. 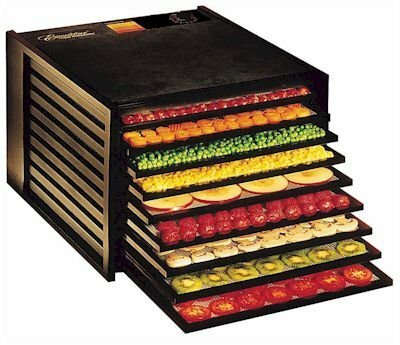 Choosing the food dehydrator based on the number of its trays is an individual preference that each of us should decide. Most of the dehydrators today have 4 to 10 trays. If you have a relatively large family, then pick the one that can dry many foods in one go! There are some food dehydrators that by default, possess only a few trays. However, they have a unique feature that lets you expand these numbers by as many as ten. This is an ideal choice if you are living alone, and are consistently visited by friends and family. As a recommendation, always choose the food dehydrator with a higher power output. If you want to keep a high temperature consistently, select a dehydrator that has a power capacity of 500 to 1000 watts. Always choose the one whose power is compatible with the dehydrator’s size. These units can generate heat of up to 160 degrees Fahrenheit. A food dehydrator is always a useful tool in the kitchen. It is a good way to cook healthy foods, and has many benefits. Essential for families and individuals who are fond of cooking their own food, rather than buying it at the market. a dehydrator makes the process quick and simple. There are a lot of choices when it comes to food dehydrators. However, we highly recommended Nesco American Harvest FD-61WHC first. We tested them personally and scrutinized each of their features so we can ensure that each of them can efficiently dry food without consuming time or power. Plus, we made sure they are all convenient to use and not too pricey! You would never get scared of getting an upgrade!